Mint is a miracle plant. Love it, or avoid it, mint really is good for your health, and it does more than give you fresh breath. Mint helps to improve your digestion, it fights fatigue and headaches, and it gives your body a boost when you are suffering from a common cold. Combine that with the abundance of Vitamin C from lemons and limes, and you have a drink that promotes your wellbeing and tastes fantastic too. Citrus and mint, like cucumber and lime, just as blueberry and lavender, makes for a nutritious infused water that is perfect for serving at a picnic or barbecue, just as it is for sipping all day long. 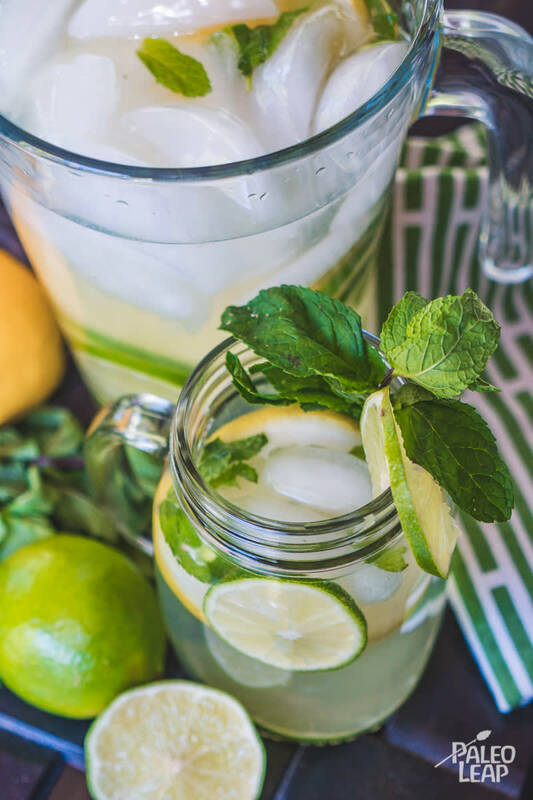 If you have been looking for ways to increase your water intake in a fun, nourishing way, infused waters are the way to go, especially if you are ready to kick the sugary soda habit to the curb. You may not even notice at first the absence of sugar, trust us, you can leave it right on the shelf – this citrus water is completely refreshing without it. Of course, if you have extra mint leaves, there is no need to let them go to waste. You can dry them thoroughly and save them for tea at a later date, or you can serve a refreshing mint and watermelon salad next to grilled chicken and vegetables. Pour the lemon juice in the bottom of a pitcher. Add the sliced lemon, limes, and mint leaves. Pour in the water, and give everything a good stir. Add the ice and serve immediately or hold the ice and refrigerate until ready to serve.